The ultimate guide to Les Gets ski holidays in 2019 & 2020. A beautiful village full of rustic Savoyard charm, Les Gets sits between Lake Geneva and Mont Blanc, with not only stunning scenery but also links to the entire Porte du Soleil ski area. With cosy mountain restaurants, a huge variety of accommodation and possibly the best Christmas spirit in France, Les Gets is not a resort to be missed. This is as close to an alpine fairy tale as it gets. A beautiful resort tucked away between Lake Geneva and Mont Blanc, Les Gets’ charm comes from rustic wooden chalets, friendly locals and the inevitably cosy atmosphere a smaller village is able to offer. Situated just an hour from Geneva Airport, it’s perfect for those who don’t want to waste a chunk of their holiday travelling, as most people who fly in the morning are able to make it onto the slopes by mid-afternoon. This is also one of the closest resorts to Calais, for those who prefer to drive - it takes just under 8 hours, making it a great choice for those who don’t want to spend too long on the road! The village itself is partly car-free, and the perfect size to go everywhere on foot. There’s a free bus circulating around the centre, and a free train that goes to the Mont Chery bubble lift from the Chavannes side. Don’t, however, be fooled by its size. Accommodation wise there’s a huge variety of chalets, hotels or apartments for any budget as well as an excellent choice of over 40 restaurants and a wealth of things to do off the slopes; including ice skating and bowling. Les Gets is one of our favourite resorts for families, and has even been named a ‘Famille Plus’ village, meaning the national tourist board has approved it as a village that offers outstanding facilities, in a safe environment, making it the obvious choice for those with children. The tourist office and staff really go the extra mile during the Christmas holidays, half-term and Easter. There’s always plenty going on for children to get involved in, and Christmas here promises to be one of the most magical in the Alps! The Les Gets/Morzine ski pass gives you access to 120km of varied pistes, with stunning scenery and breath-taking views of Mont Blanc on a clear day. Those who are looking to ski further afield have easy access to the whole Portes du Soleil area, with a massive 650km of pistes to be explored and enjoyed. View our detailed Les Gets snow forecast or snow report and see all live webcams, piste maps, road and travel maps and lift pass prices. For a picture of historic snow conditions see the snow depths month by month with our Les Gets snow history. Les Gets has a number of ski schools, making it an excellent place for children and beginners - most have bi-lingual instructors, and the resort’s popularity with families means instructors are well versed in teaching children to ski. A designated beginner park called ‘Mappy’s Area’ is close the Chavannes cable car, with gentle slopes, several magic carpets and rope tows. There are good blue runs near the centre of town, and further up towards Chavannes, for any older learners who want to enjoy some of the areas’ stunning scenery - the ‘Bluet’ is really lovely. For children, a wild west themed park called ‘Territoire du Grand Cry’ has special moguled piste and banked turns for practise, treasure hunts, face painting and drawing competitions, as well as a picnic area come lunchtime. There is also an ‘educational run’, sponsored by Milka, to teach children about Alpine environments, with chocolate and educational signs along the way. Entertainment is normally provided in this area in the French school holidays. Mont Chery has a good variation of red runs, like the ‘Tulipe’, and a slightly quieter set of pistes. Taking the Ranfailly Express up towards Ranfailly will connect you with great red runs like ‘Fenerets’ to ski back towards the village, or ‘Chevrelles’ to ski towards Morzine. The Nauchets Express lift towards the Secteur Charniaz has 3 long red runs back to the resort. There are good steep black runs like the ‘Myrtilles’ and the ‘Yeti’ for advanced skiers, on the Mont Chery side of the town, and down from La Rosta on the Chavannes Side. Excellent tree skiing and off piste opportunities exist a bit further a field in the Chamossiere & Nyon areas above Morzine, with a number of black runs and the infamous Yeti Mogul Field. The Snowpark in Mont Chery has rails, kicks and boxes as well as a new free style airbag that is open most afternoons. There’s also a new Videopark; that usually opens mid-morning until the slopes close, a fantastic opportunity for skiers and boarders to have their best runs filmed, to view technique and improve style. Whilst the resort isn’t primarily known for a huge après ski scene, a choice of over 100 shops, bars and restaurants means there’s definitely fun to be had after a long day on the slopes. There are several lively bars and most will stay open until about 2am. The Irish pub is great for its friendly atmosphere, home-brewed beers, live music and great tapas. The Black Bear is child friendly, with a pool table, and the Black Bush hosts a range of fancy dress nights. If 2am isn’t late enough for you, Igloo nightclub is open until 4am every morning. It was the first nightclub to open in the French Alps in 1938, which means any visits count as cultural education! Anyone wanting a calmer drink at the end of the day should head to the hotel Chamois d’Or, offering a chic setting for wine, cocktails and champagne, with sport playing on big screens throughout the evening. The gastronomy scene is alive and well with lots of choice where restaurants are concerned. For traditional French haute-cuisine, visit the newly opened Quatre Saisons, for fine wines and high quality cooking. Anyone keen to sample traditional Savoyard recipes (think hot cheese served many ways!) should visit La R’mize, nestled in the centre of the village, famous also for fresh fish from a nearby lake. La Flambeau is also well worth a visit. Run by a married couple, channelling a vintage tea-room décor, it offers traditional French dishes, snails included, for very reasonable prices. For those keen on post-skiing relaxation, there’s the beautiful ‘Spa Serini Cîmes’, offering treatments and massages from all 5 continents of the world. The traditional market held every Thursday morning, where the locals sell their artisan French produce and crafts, is definitely worth a mention, and indeed a morning off the slopes. When is the best time to ski Les Gets? The Portes du Soleil region is very unique due to its position between the cold fronts of Mont Blanc and the humidity of Lake Geneva, and this micro-climate often results in heavy snow fall. Couple this with excellent snow making technology and the result is usually good snow for the majority of the season. Although it is lower in altitude, the grassy slopes mean that less snow is needed for good coverage, and tree lined runs will offer protection from wind, ice and poor visibility. January is cold, so the snow quality is excellent, but February/March offers a higher snow quantity and more powder. 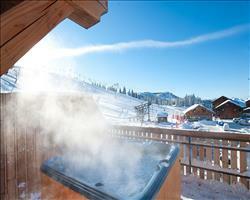 Anyone with a ‘Portes du Soleil’ pass can ski up to Avoriaz, which boasts the highest altitudes. 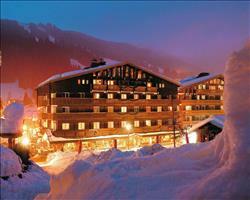 Christmas and New Year are extremely popular and Les Gets also plays host to a number of exciting mid-season events. These include the Big Mountain Battle, which sees teams compete to be the quickest to complete a list of checkpoints across the resort and mountains, a Valentine’s Day tradition of a romantic meal in the Mont Chery bubble lift and the hugely popular Rock the Pistes music festival ‘Go Wilde’. Les Gets really comes into its own when providing first class family holidays. It has been awarded the title of Famille Plus resort by the French tourist board, meaning that it met some 110 criteria proving it could provide outstanding facilities and services geared specifically towards families with children of any age. 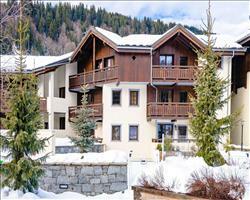 Families looking for a ski holiday on a budget should consider self-catering apartments. With no prescribed routine or set meal times, they offer more freedom than any other accommodation option. There’s a Carrefour supermarket in the centre of the resort, so food shopping needn’t be a battle, and enough restaurants to easily justify going nowhere near the kitchen a couple of nights during the week! Sleeping up to 6, and just a 3 minute walk from the village, Les Fermes Emigay apartments are well worth checking out if you’re interested in this option. For those who prefer the routine of catered holidays, and the ease of avoiding food prep, a hotel or chalet is a great option. Many hotels and chalets come with an in house childcare option, if you’re travelling with little ones too young for ski school. If this is something you would be interested in, do give us a call for information on the best properties for this service. Chalet Martine is particularly popular with families as it is in a slightly quieter area and only a couple of minutes’ walk to the closest lift, meaning little ones won’t be struggling with heavy skis for a long distance. Christmas here is one the reasons Les Gets is such a popular family resort, when the tourist office goes out of its way to make sure it’s the most magical time of year. From spotting Santa on the chairlift to watching elf gymnastics in the village square, it’s one of the best resorts in the Alps for festive cheer, and definitely one to consider if you want Christmas fun for all the family, and good quality skiing. Half-term and Easter are also great times to book a holiday to Les Gets, there’s always plenty of things going on, and special children’s activities in the ski/activity area. The beauty of this resort is its incredibly short transfer time of an hour from Geneva Airport, so a holiday with flights and transfers included is a great stress-free option. Alternatively, because the village also has one of the shortest drive times – of just under 8 hours – from Calais, a self-drive package is an equally good choice for those who want to drive, but don’t want to spend too long on the road. Accommodation is also available on its own if you want to arrange your own transport. Groups travelling to Les Gets have an excellent choice of accommodation; those who don’t mind self-catering should check out Les Fermes Emigay apartments, each one sleeps up to 6, and is only 3 minutes from the village centre. Practically speaking, they’re close to the supermarket so lugging heavy shopping bags across ice won’t be a problem, and there’s the added bonus of them being just 3 minutes from the restaurants and bars. If a group is unsure on concrete numbers, a large hotel like the Marmotte is the perfect choice as it allows stragglers to book up later, once they’ve made up their minds and offers the closest thing to ski-in ski-out location, with the nearest lift being just under a minute away. Hotels are great for large groups due to the larger communal spaces like bars, restaurants and swimming pools they tend to provide. The other option for groups is to get an exact number and book out one of our beautiful alpine chalets. Most of our chalets are catered, so all your meals will be prepared for you, and you manage to avoid squabbles about whose turn it is to wash up! Exclusive use of all the facilities and the traditional Savoyard charm of a Les Gets chalet will ensure a really special holiday. 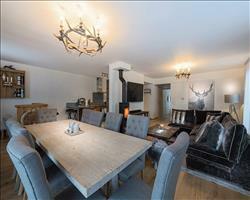 The Chalet Johmarons is perfect if you’re a group of 8 wanting exclusive use of a chalet throughout your holiday. In terms of the skiing, Les Gets is a great resort due to its links with the Portes du Soleil region, which offers over 600km of pistes to be explored. A local lift pass will give you access to 120km of really varied terrain, so group members can choose what they ski and how far they push themselves. Learners in a group are well catered for by ‘Mappy’s Area’, a designated beginner park close to the Chavannes lift. Intermediates will find good red runs on the Mont Chery side of the village, and advanced level group members will find challenging black runs on the Mont Chery section, and further afield in the Nyon and Chammossiere areas. Whilst Les Gets isn’t known for its après-ski, there’s definitely nightlife to be enjoyed. Bars like the Black Bear are great for groups, with lots of seating and pool tables too. If your group really wants to get into the spirit of things, the Black Bush hosts a number of fancy dress nights, so save room in your suitcase! There’s also Igloo nightclub for any nights where 2am just isn’t late enough, open until around 4am, it’s the perfect place to end your evening. Aside from eating and drinking, anyone wanting a break from slopes can visit the resorts cinema, bowling alley or the centrally located ice-rink. There is also the spa Serini Cîmes, offering massages and other treatments from all around the world. Any non-skiers who don’t want to miss out on the fun can organise day trips to nearby Geneva or go walking on the specially cleared mountain trails. Despite it being one of the smaller resorts in the Portes du Soleil, Les Gets is well equipped to provide a group of any size with a really memorable and enjoyable holiday. Make your holiday as easy as possible by booking everyone onto a holiday with flight and transfers, or channel crossings if you’d rather drive. Alternatively, if things are proving tricky to organise, book one of our accommodation only holidays, to allow time to sort out travel. I had a great week in Les Gets. Luckily for us it was the week before the French half term so the slopes weren’t too busy. Rather than having just a few runs of each level, Les Gets has a large variety of different coloured slopes all over the area. You get halfway down a blue and then it splits off into a red or green, so you can spend the whole day doing five or six different runs down the same mountain rather than having the same runs over and over again. I was told it was a very snowboard-centred resort which is why I came here but it actually has a much greater spread, more 50/50 skiers and snowboarders than predominantly boarders – this wasn’t a problem for me though. There are certain flat areas where you couldn’t go on a snowboard but there were certainly enough beginner and intermediate runs to enjoy. I had lessons every day in the morning which was great and then decided to rent skis so I could ski some of the more advanced slopes in the afternoons. You can take the bus down the road to Morzine which I didn’t end up doing, but some people I stayed with did and thoroughly enjoyed it. There isn’t much here by way of non-ski activities - everything's more focussed on skiing, but Les Gets does have a good nightlife with a lot of good bars and restaurants and a few clubs. Weather wise we had a bit of cloud cover on the first couple days as well as heavy snow pretty much every night – the mornings were clear and then it would cloud over later on. This wasn’t a huge problem as the runs are very wide so there are lots of escape routes. Les Gets itself is a lovely resort – a manageable size and brilliant for families. My family had a great time here, and some friends who went the week after did too! "Why locals love Les Gets resort"
Les Gets is lovely, very expensive but lovely. We went out a couple of afternoons with the kids and did the dog sleigh race and there’s ice skating too. It has a short transfer time. "Wonderful week in Les Gets"
Had a wonderful week, beautiful weather and one snowy day. Les Gets is perfect for mixed abilities, pistes are true blues and reds and the blues are nice and cruisey. Lovely mountain restaurants. Only problems I had were with the documentation for check in 24 hours before, and I wasn't happy with BA after we arrived 2 hours prior to check in and it still wasnt open 1 hour 45 later. We love Les Gets and have skied here a few times. It’s a really good ski resort, good for families and intermediate skiers. It’s beautiful and very pretty, still with the charm that some purpose built ski resorts don’t have. It’s not too expensive either, and has all the facilities and restaurants you need. End of season snow was a bit iffy, but if you’re a good enough skier you can venture out to better conditions. There isn’t stacks to do in the village (drinking, eating, bit of ice skating) but as long as you’re centered around skiing it’s fine. In general I would recommend Les Gets to beginners. We went up to the next village for the swimming but didn’t realize you could only swim in speedos which caused a bit of an issue! Les Gets is a nice, family orientated resort. As an intermediate I enjoyed the skiing. There are plenty of nice cafes and we did some shopping while we were there. There is also an ice rink. The only thing that we felt it lacked was some good parks for our children to play in, the parks that were there were too grown up for them. We went out of peak season but it wasn’t overly quiet while we were there. There weren’t many queues though which is always good. The transfer to the resort was ok, it was probably the maximum length we would want to do with small children though, around 1h30. "Lovely little town in big linked area"
In a nutshell, ski Holidays in Les Gets are: 1 - Just a stone’s throw away from the France/Switzerland border and just over an hour away from Geneva 2 - Les Gets is part of the largest ski resort in Europe 3 - the ‘Portes du Soleil’. Les Gets is perfectly tailored for families, intermediates and those wanting to avoid packed slopes. But don’t be put off if that doesn’t sound like you. There really is something for everyone in this resort – especially if you choose a ski pass for the whole ‘Portes du Soleil’ resort! Les Gets is part of a resort where you literally can ski between countries if you want. "VERY big skiing with Portes du Soleil pass"
Skiing In Les Gets -Les Gets Is undeniably a family-focused resort but still offers a lot for everyone in terms of skiing– particularly if you choose a ski pass for the whole ‘Portes du Soleil’ resort. -For beginners there is still much more choice than in other resorts. The Chavannes part of Les Gets is particularly useful for beginners. 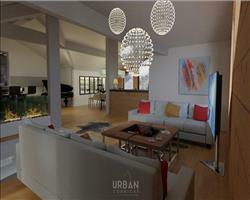 It has a beginners’ snow front area that has been completely renovated and is easy to access. Most of the ski lifts and gondolas to the area now all arrive on one level making the snow-front area for beginners easy to access for all. The Les Gets resort has also thought of children with a particular piste ‘Le Grand Cry’ on Chavannes mountain being children-only – meaning that children can learn safely. Other routes also exist for beginners such as small runs down the main street and also gentle areas such as ‘Blanchot’ (which consists only of green and blue runs) which are perfect for beginners and families to learn in peace. So novices and those learning gradually to ski are served well by ‘Les Gets’ - especially with pistes being less busy than rival resorts. 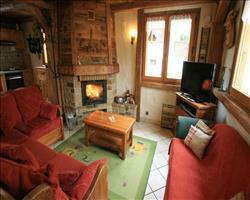 -However, Les Gets itself is particularly suited to intermediates (particularly families). Over 110km of Les Gets’s routes are green, blue or red pistes. And if skiers choose to get the ski pass for the entire ‘Portes du Soleil’ there is over 500km of green to red runs across the entire ‘Portes du Soleil’ resort – meaning there’ll always be a new run to try. The fact so many of the routes in Les Gets and the entire ‘Portes’ resort are green to red make it perfect for skiers (like families) who want to challenge themselves, who want some variety in slopes but who aren’t totally ready to do challenging black runs confidently yet. Also, a variety of ski schools including ESF provide courses and lessons for this resort – which, again, makes Les Gets perfect for beginner or intermediate skiers who want to improve their skiing as lessons are provided and many reasonable ski routes are available. But for experts and advanced, experienced skiers– there is still a lot to offer (despite the majority of Les Gets being best suited to intermediate and family skiers). 9 black runs exist in Les Gets alone including ‘Bouquetin’ and ‘Yeti’ - with most of the challenging routes being found on the Mont Chery part of Les Gets. The mountains of Les Gets have forests as well – so off-piste skiing opportunities through the forests are available too for those brave enough to do it. But another possibility for advanced skiing is to take the ‘Portes du Soleil’ ski pass. Over 650km of routes then exist including many more challenging red and black routes in the other ski resorts that make up the ‘Portes du Soleil’ ski resort. So there is no limit on the skiing options available in Les Gets. There is a mix of routes and there is even more choice if a ski pass for all the ‘Portes du soleil’ area is bought (as it gives access to even more routes and resorts). "Good apres ski not just for young party animals"
Après-Ski in Les Gets -Les Gets is primarily a family-friendly, traditional resort and may not have the carnival après-ski party atmosphere of some local rivals but don’t be deceived - there are still plenty of things to do for people of all ages and different tastes once skiing is done for the day. -For those looking for livelier evenings, there are a fantastic selection of bars to choose from. The Irish Bar is one of the main bars in the town and offers regular live music, tapas served and also homebrewed beer and it’s not hard to see why it’s popular. Other fine bars are available (many providing Wi-Fi) – with options like Urban Cafe and Bar Bush showing live sports if you’re interested in watching some sport after a day of skiing. The main club in town, if you want to go clubbing, is the Igloo bar which stays open until a rather late 4am – if you can stay up that late that is! But, as said above, the resort is mainly a family-friendly resort and plenty is available for the family (and anyone else) to enjoy and participate in. Facilities such as a cinema (which shows films in English), bowling alleys and ice rinks are available in the village to do. And to keep younger ones entertained, if they’re lucky, around Christmas (between the 22nd and 28th December) it’s possible to meet Father Christmas no less! It’s also possible to have a tour through Santa’s enchanted forest over that period – which younger children can enjoy. More extreme activities are available too if you feel adventurous – for example paragliding, dog-sled riding (if your nerves can stand it) and snowshoeing which offers the opportunity to visit some remote areas of the resort. But for those wanting a more chilled and relaxed après-ski, many options exist to relax or eat out. To lose any aches and pains after a tough day of skiing, there is a Wellness Centre with facilities including Jacuzzis and saunas. Just what you need after a full day’s skiing! A huge variety of around 40 restaurants exist too to have a dine out at in the village. On the whole, the restaurants are charming, warm and importantly won’t break the budget. Restaurants like La Case K2 and Le Flambeau are among those highly rated and regarded but plenty of other high-quality options are available in the village (and in the mountains during the day) that are good value. So Les Gets may be traditional and friendly but it still has something for everyone – from late night clubs to bars and restaurants to extreme activities.